Some people can see emotions as a bit of a weakness, something that can stand in your way and cloud your judgement. While having strong emotions can be a strength, that isn’t how everyone sees it. Emotions do make it difficult to make certain decisions and can be something that causes people to give into others. 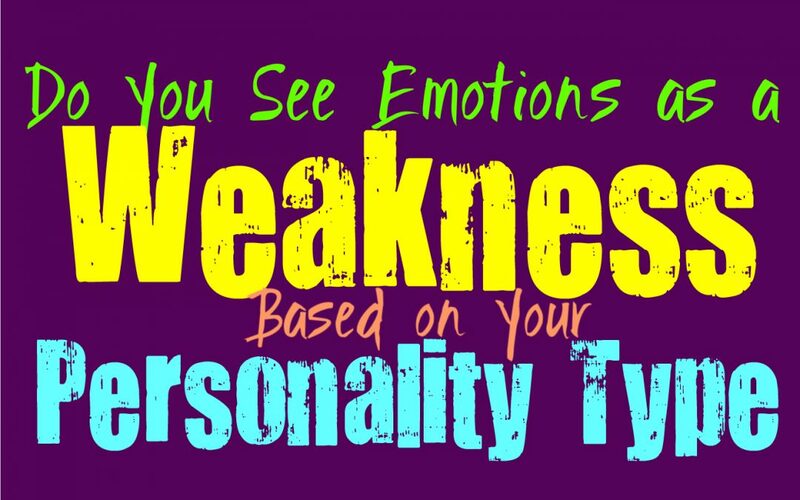 Here is how much you see emotions as a weakness, based on your personality type. INFJs don’t often see the emotions of others as weakness, instead they do their best to show comfort and compassion. INFJs don’t see it as a weakness when other people express their feelings or show their pain, but they are different when it comes to their own emotions. They can be rather hard on themselves and can often feel like their own emotions are weakness. For them it is about showing this to others and feeling judged for it, so they don’t often feel comfortable expressing it to most people. ENFJs don’t often see the emotions of others as weakness, since they are more understanding and compassionate than that. They care about others and want to do what they can to support them and allow them to feel comfortable opening up. ENFJs don’t judge others for their emotions, instead they seek to help them and bring them comfort. While they often feel warm towards the emotions of others, but when it comes to their own feelings they can be harsh. ENFJs are hard on themselves and can feel like their own emotions are a sign of weakness. INFPs certainly don’t see emotions as a weakness, instead they see neglected them as one. They understand that their own feelings are important and that they need to accept and process them. For the INFP their emotions are often their guide and provide them with a strong sense of morals. INFPs are more likely to look at the lack of emotions as a weakness, since it means someone is afraid to face what they are feeling. For them it is valuable to connect with their own emotions and understand what they truly mean. ENFPs don’t see emotions as weakness, and instead they often value their importance. There are times when the ENFP might be afraid of showing their own feelings, especially if they have been hurt in the past. The ENFP who has endured judgement or pain for their own emotions, can have a hard time expressing themselves the way that should be natural for them. Most of the time though ENFPs value their own inner emotions and believe in following their hearts. INTJs can see emotions as a weakness sometimes, especially when people allow them to cloud their judgement. They believe in doing their best to get things done as efficiently as possible. For INTJs it is important to focus on facts and logic, rather than allow their feelings to get in the way. They can sometimes see people’s inability to contain their emotions as a weakness, and they feel this will stand in their way. They understand that some people have a hard time containing their feelings, but they believe they should do their best to control themselves and focus more on their minds. ENTJs do often see emotions as a weakness, since they witness how it holds people back. They believe in being strong and doing what they can to control or even push aside their feelings. ENTJs believe that people who are emotional and incapable of controlling their feelings, are weak and will make many mistakes in life. They are focused and driven people who value being efficient and using their minds much more than their emotions in life. INTPs can have a hard time coping with emotions and in some cases they might find them to be a bit of a weakness. They might feel like emotions hold them back from seeing things clearly, and cause them to make choice that aren’t logical. They don’t find themselves easily judging others emotions, but it can be hard for them to understand them. INTPs would prefer to focus on facts and logic and they do their best to follow a more strategic mindset. ENTPs can see their own emotions as a weakness, since they can cloud their judgement. They believe in looking at things logically and have a hard time facing their own feelings most of the time. ENTPs do care about their loved ones and want them to know this, but expressing themselves can be challenging. They often believe in favoring logic and reason, instead of emotions and feelings. For the ENTP their emotions often feel like a weakness and not a strength. ISTJs do often see emotions as a weakness, mostly because they prefer to focus on facts. For the ISTJ emotions can only get in the way and prevent them from getting things done. They work hard to be efficient and take care of their loved ones. For the ISTJ being practical and sensible is more important than allowing emotions to get in the way. For them emotions can be a weakness, especially for people who cannot seem to control them. ESTJs can have a hard time processing emotions and in most cases they do believe that they are a weakness. For ESTJs focusing on their feelings can only make them into a liability. They are more interested in facts and being as practical as possible. They don’t want to allow anything to stand in their way, especially not their emotions. ESTJs can be afraid that others will judge their feelings if they expose them, and so most of the time they are far too afraid to open up. ISFJs don’t usually see emotions as a weakness, instead they strive to understand them. They provide comfort for their loved ones when they open up to them, and work hard to solve their problems. ISFJs can sometimes see their own internal emotions as a weakness, or possibly a liability. They don’t want to do anything that might make life harder for their loved ones, and so they often neglect their own feelings because of this. ESFJs can have a hard time dealing with their own emotions, since they can feel like they are hurting others. They don’t want their actions to stand in the way of someone else’s needs, so they often neglect their own feelings. For the ESFJ it can feel like their own emotions are a weakness that could harm others. When it comes to the emotions of those around them, they often feel quite the opposite. ESFJs are harder on themselves and often a bit more lenient on the ones they love. ISTPs don’t like allowing emotions to get in the way, but that doesn’t mean they see them as a weakness. They don’t want do allow emotions to take control, but that doesn’t mean they consider them to always be a weakness. For the ISTP emotions only become a weakness for people who allow their feelings to control them and keep them from observing the facts of a situation. ESTPs live very much in the present moment and most of the time they don’t consider emotions to be a major weakness. They can sometimes allow their own feelings to take charge, depending on the situation. For ESTPs it is important to follow what feels right instead of allowing others to pressure them into behaving a certain way. They do their best to follow the facts of a situation, and maintain a sense of knowledge and awareness which helps them avoid too many weaknesses when it comes to emotions. ISFPs follow their hearts and their inner morals, and so they don’t believe that emotions are a weakness. For the ISFP their strength often lies in their emotions and their ability to follow their own ideals and morals. If the ISFP were to neglect their own feelings, in that situation it would actually weaken their abilities and make them feel overwhelmed. ISFPs strive to follow their hearts and will always do what they believe is right and to them that is not a weakness. ESFPs don’t believe that emotions are a weakness, instead they believe they are extremely important. They follow their hearts and do what feels right for them in the moment. ESFPs have strong inner morals and they don’t like allowing others to dictate their actions. For them it is important to pay attention to their own emotional needs, instead of neglecting them or pushing them aside. ESFPs don’t see emotions as a weakness, they often see ignoring them as more of a weakness.